4K still feels like a new technology, but 8K is also coming as HDMI 2.1, superMHL, and DisplayPort 1.4 all support 8K QUHD (Quad Ultra HD) resolutions up to 60 or 120 fps. So at some points will need some SoC, media players, and TVs support the new higher resolution. 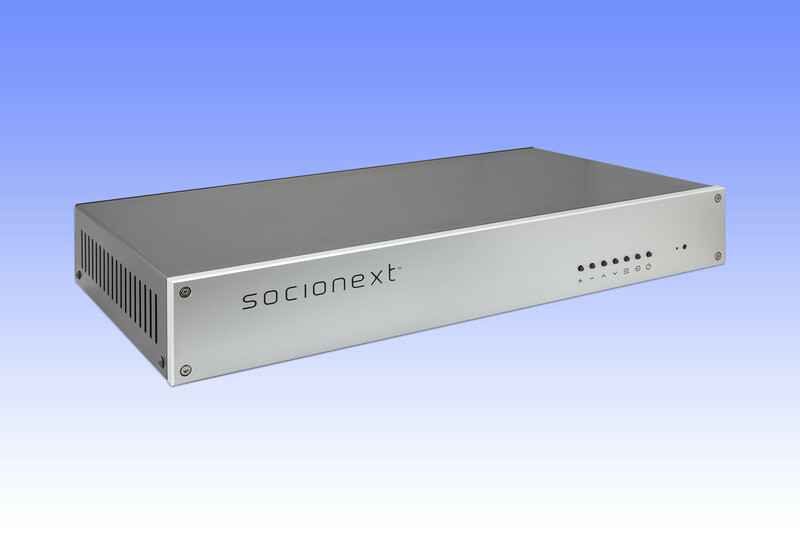 Socionext is working on this with their S8 media player powered by the company’s proprietary 8K HEVC SC1400A decoder chip, and that will be offered to “operators and service providers of video streaming for various applications including public viewing and digital signage”, starting in March 2018. The company’s claim that S8 is the “world’s smallest and lightest 8K / 4K compatible media player” clearly shows that it’s quite early for 8K, as the device is rather large, heavy and power hungry, and relies not on a single HDMI 2.1 port, but instead four HDMI 2.0 ports. The audio subsystem is also impressive with 22.2 channels I2S audio (I had to read that twice). Price confirms that the device targets businesses for now, as a sample is said to cost around 2,500,000 JPY (roughly @22,000 US). The company also provides an 8K HEVC real encoder system, built with four units of 4K/60p HEVC encoder MB86M31 SoCs allowing for streaming of live events. I was lucky enough to get to visit with Thom Holman @ USC, where he is a professor in the EE dept with acoustic engineering among other disciplines he has access too. He had a lab with 30 speakers per side, surrounding a listening area, about 20′ square, with a large display (projection) at the time. This system would start to be useful for that sound room. He had a demo of a proprietary technology he was practicing on people, and myself and 3 other friends were guinea pigs for him. He’d been giving the presentation to executives, and wondered if others got what he was after, and needless to say it was impressive. If you wonder who Thom is, look up THX. Wow.. 22 thousand dollars? That’s insane! I was looking to see if amlogic is working on any 8k capable chipsets, but I guess we’ll have to wait for HDMI 2.1 standard to officially arrive first.